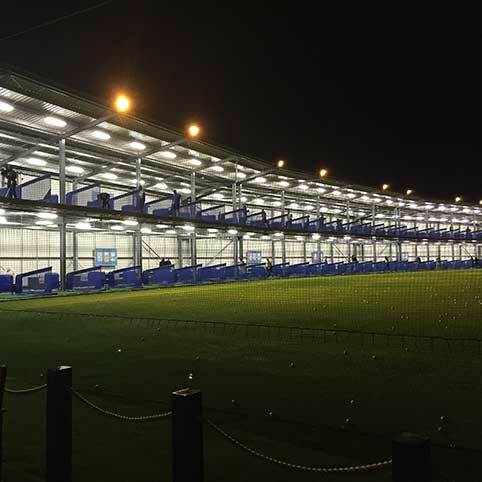 A casual fine dining restaurant on a golf driving range? Let’s get wood at Vinothec Compass. are in fact golf balls, and as Michael Caine noted in the film Zulu, there are ‘fahsands of ‘em’. 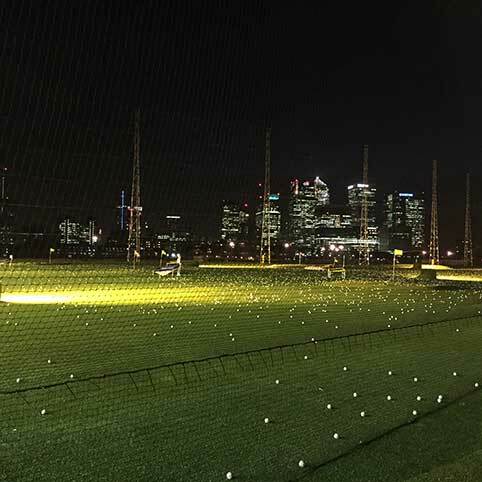 From the two tiered stand at N1 Golf London, scores of golfers are relentlessly whacking balls out into the sky and the only thing stopping them from sailing on to land in Canary Wharf, glistening like a mini Dubai in the fast setting sun, are giant nets. I have a go, my only golf experience up to this point being Crazy Golf (if you want to know how to get around the miniature windmill in two shots, just ask me). This is not enough it seems to handle a real golf club as I swipe wildly into the air twice and then hit the ground on the third go with enough force to almost pop my shoulder out of its socket. One of the many golf pros on standby steps in, adjusting my stance and showing me how to bend my legs, my arms and how to follow through. Amazingly on my next attempt there is a solid connection and the ball arcs outward like a bullet in a most satisfying way. I can see how golfers can get hooked on the feeling. Anyone can have a go, N1 charges £ 12 for 120 balls (£10 off-peak) or 60 for £6 and there are worse ways to spend a lunch hour or early evening, but it sure makes you hungry. Fortunately there is the 19th hole, Vinothec Compass a new restaurant that’s a long way from the traditional clubhouse with its coronation chicken sandwiches and Jaguar Mk II driving men ordering a G&T for the little lady. The restaurant is airy, canteen-like which goes with the ‘casual fine dining’ label it has given itself. People today, we are told, don’t like fine dining, have a phobia about napkins, a fear of tablecloths and a visceral hatred for waiters who glide instead of walking. On the other hand we don’t all want to eat American Casual Dining, or expensive junk food as it’s better known, all the time. So what lies between? Well step forward Vinothec Compass. 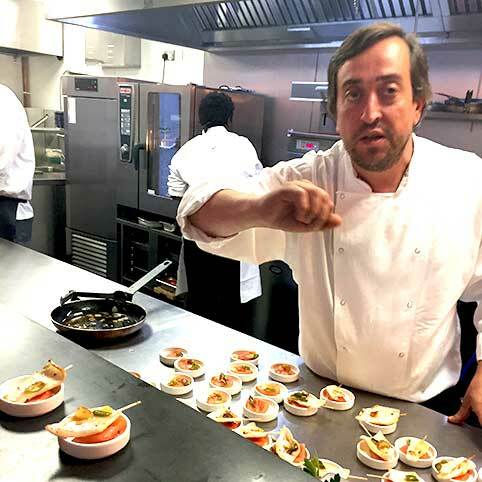 Arnaud Compass, a geographer and geologist by training, and Keith Lyon are the founding partners here and they have invited me to sample a selection of miniature tasting versions of chef Jordi Rovira Segovia’s menu along with wines Keith has chosen himself. One wall of the restaurant is lined with bottles bearing simple price tags that belie their far from simple prices. 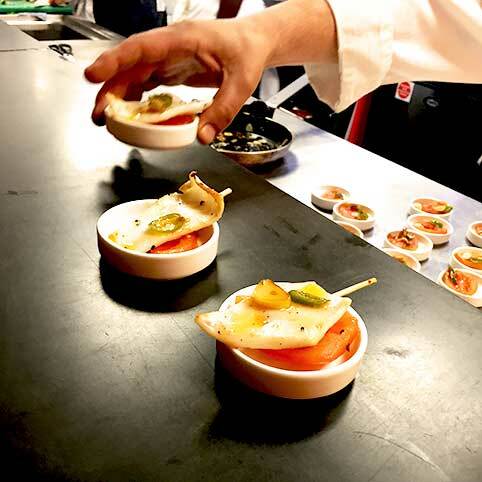 We eat tapas of baby squid, tomato and coriander along with Chardonnay from Bulgaria, a Château Burgozone 2012. The squid is excellently cooked, smoky and soft and the Chardonnay likes it. 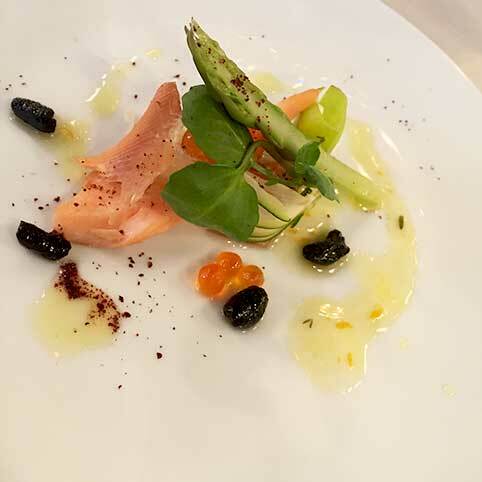 Next up a dish that almost required a magnifying glass to view, this was of course just a taster though, of labneh, dried black olives, asparagus, citrus vinaigrette and fresh oregano with salmon roe. A Volubilia 2013 Moroccan Mourvèdre, Tempranillo, Vin Gris rosé was excellent and the food sharp and clear and the dried olives little nuts of concentrated flavour. 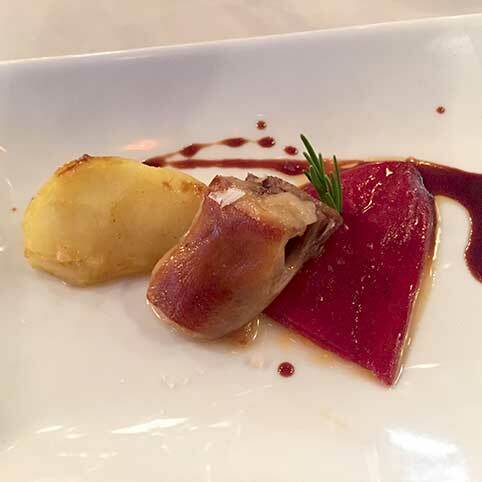 Suckling piglet belly with piquillo was fatty in a good way, melting into the mouth and served with a red that was slightly below room temperature with a slight chill to the bottle. Arnaud explaining that room temperature was often too warm, nowadays. Couvent des Jacobins 2005, a St Emilion Grand cru is a concentrated, darkly attractive wine already softening in its tannins but with still perhaps a few years left yet to achieve its full potential. 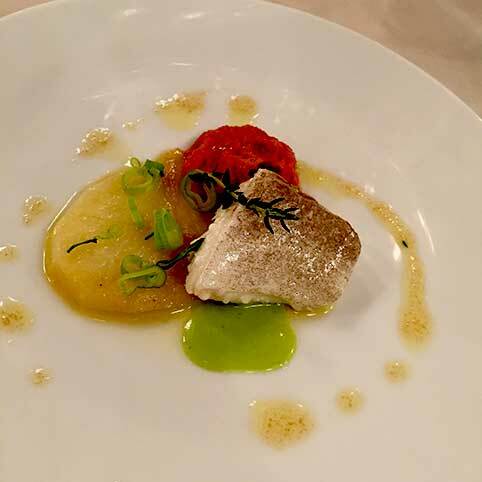 A piece of cod that passeth all understanding was next, fresh from Billingsgate and delightfully firm and well textured with slippery Romesco sauce, the wine Arnaud chose came from where he grew up, Dido 2013 from Montsant vineyards. It had nothing to do with the MOR made in Chelsea chanteuse fortunately and was intriguing in its ‘thick’ texture. 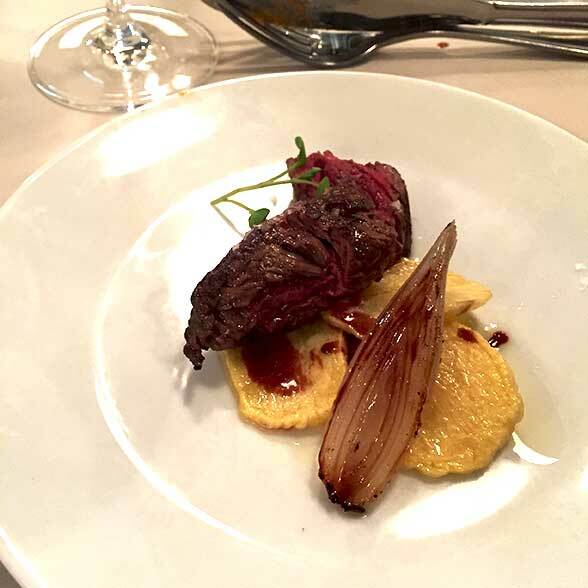 Arnaud rather bravely stuck with this white for the, much anticipated by me, Longhorn Onglet, served rare as it simply has to be, from a fifth generation butcher in Chipping Barnet. A superb piece of meat, one that I regard as the best steak of all. Dido accompanied it (sic) very well indeed and I could have eaten a great deal more of it given half a chance. Finally, a deconstructed Vinothec Cheesecake made with cheese named after Jean Anselme Brillat-Savarin. A feast of fats it was as lush as could be and for once I was happy at the reduced portion size. Arnaud served his last bottle of 1971 Rivesaltes, a part of France I remember only vaguely because while I was there I drank Rivesaltes out of litre containers filled from converted petrol pumps – happy days, if now very blurred ones, of being almost constantly drunk and making expeditions in the dead of night across the border to Spain to smuggle back soft drugs. It was thirty years ago, I hasten to add, so don’t go try writing me up for that bizness, seen? Anyway we downed some espressos from one man band artisan roaster, Francis Bradshaw and I rolled out into the night in search of a kebab, well as I keep saying, they were very small portions. You may not feel that trundling out to what still feels rather like the ends of the earth to eat is worth the trip, but I feel you should reconsider. The food was excellent, the wines clearly well chosen and with plenty more to choose from as well. And you get a chance to thwack golf balls into space, what more do you want? Down in ‘Fannet’ food has taken a space age turn. 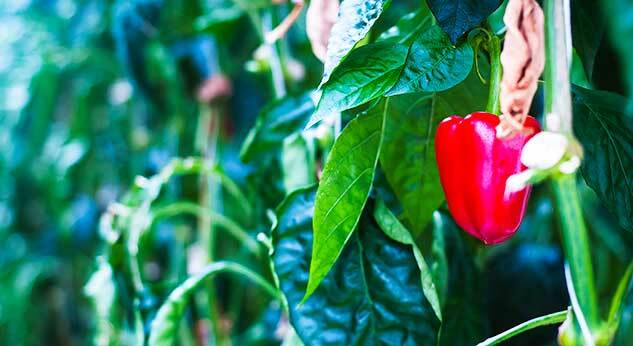 Nick Harman visits the UK’s biggest greenhouse complex to find how our red, yellow and green peppers are produced. I can’t get rid of it; ‘This is Planet Earth’ by Duran Duran keeps looping around my brain as we wait for security clearance to enter the world of Thanet Earth. Damn those catchy 80s popsters and their irresistible ‘hooks’. I soon lose the beat though as we round a corner and I get my first sight of the massive greenhouses covering the rough equivalent of four Heathrow terminals, or 40 football pitches if that helps. Very, very big, is perhaps the best way of putting it. Now four clean, bright and odour-free greenhouses occupy the space instead. They stand on compacted earth with as little concrete as possible used in their construction. This is what modern farming looks like; efficient, virtually waste-free, ecologically as sound as possible and with no mud or muck about. 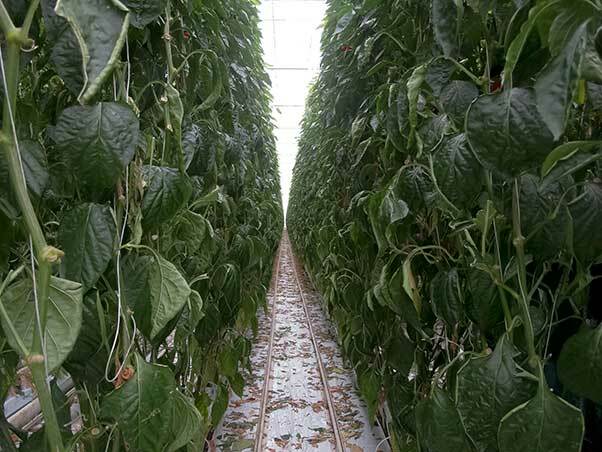 The greenhouses are each used for specific crops; two for tomatoes and one each for cucumbers and sweet peppers. It’s the pepper house I’m visiting to meet Pleun van Malkenhorst the managing director of the operation for Rainbow UK, which is a Dutch company, you probably won’t be surprised to learn. 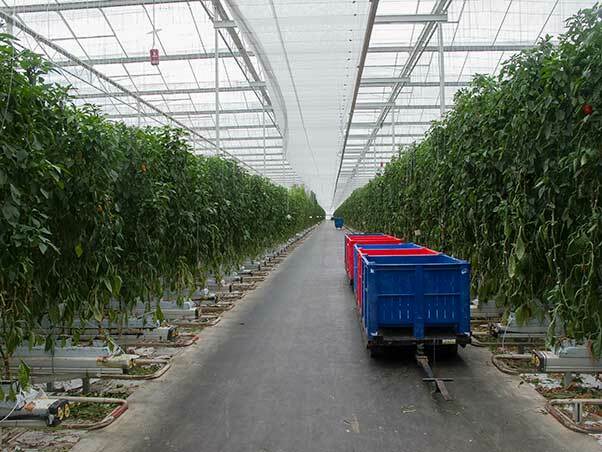 The Dutch of course have been growing things in large greenhouses for a long time, but now by growing peppers hydroponically in the UK they cut down on the expense of shipping them to our hungry market, as well as the pollution involved in mass transport. Pleun’s job is not that of any ordinary farmer. 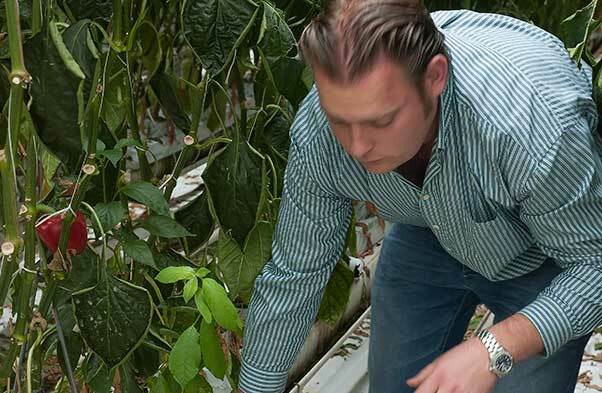 He gets around his 20 acre farm by bike, not tractor, and with around a quarter of a million producing plants to look after he has to be a smart scientist to keep everything happy. Computer systems make sure nutrients like potassium, nitrogen, calcium, iron and magnesium are precisely delivered to the plants, along with carbon dioxide. Systems outside keep an eye on the temperature, the strength of sunlight and even the wind and where it’s coming from in order to work the vents efficiently. And uniquely Pleun also has to buy and sell energy. Plants of course love carbon dioxide and turn it into oxygen, as we all remember from our school biology lessons. 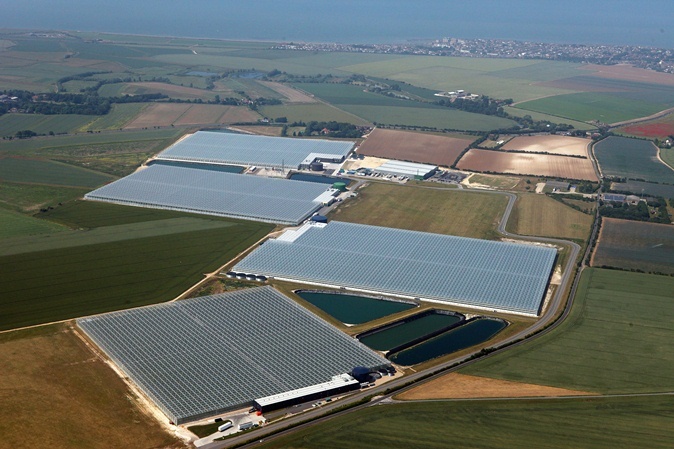 The massive glass roofs channel up to 50 million gallons of rainwater a year into giant storage tanks, free water that’s used to carry the nutrients to the base of each plant sitting in its rockwool trough. Any water that runs off from the plants is captured, filtered and used again. 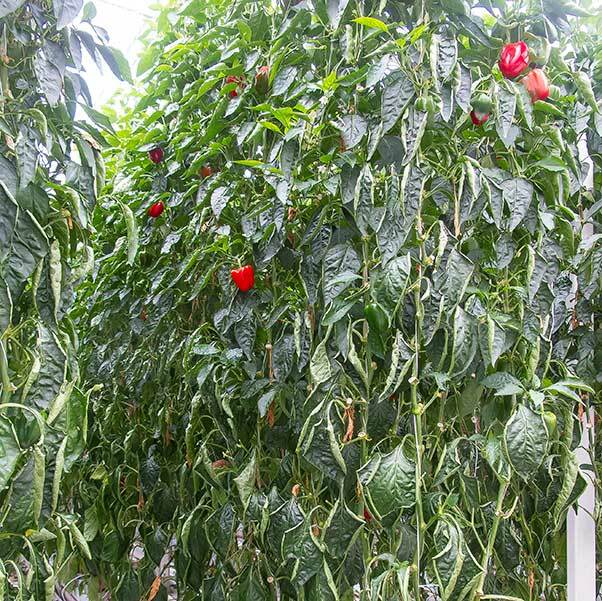 By growing the pepper plants up strings, Pleun achieves an average height of 12 feet and they’re producing fruit all the time they are growing. Green (unripe) peppers and the fully ripe red and yellows. Teams are picking regularly and reporting back via terminals stationed around the rows on yield and any problems. Like bugs. And of course the generous light levels in this part of the UK do the rest, delivering the ultraviolet and, in the summer, the warmth too. 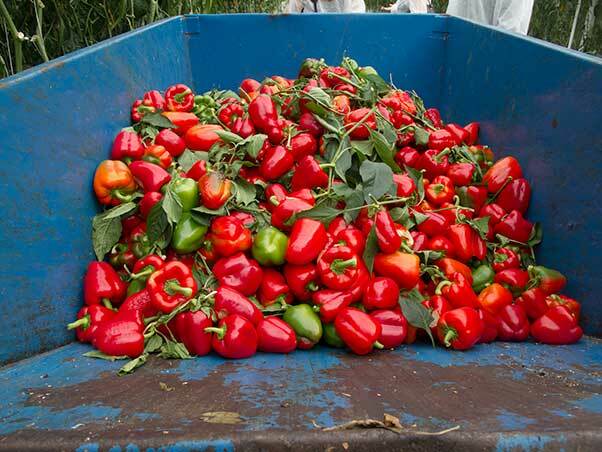 Production of peppers runs from March to November and then the exhausted plants go to compost and the whole thing gets ready to start again. 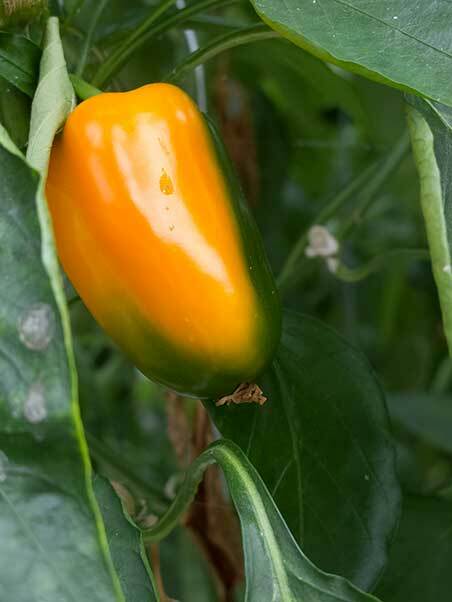 The peppers that come off the plant are uniform in size, shiny, healthy, traffic-light bright and crisp and juicy. Not just the familiar Bell Peppers but also Large Pointed Peppers and Baby Peppers too. They’re packed by a state of the art operation on site and dispatched to supermarkets swiftly and efficiently. And do they taste good? Over at the East Kent College Cookery School the students are away for the summer break so chef Guus Vredenburgtakes me into the teaching kitchen and we knock up some simple pepper dishes: Stir fried orange pepper with chicken, Pepper salad with goat cheese and walnuts, Gazpacho and Peperonata. As we ate I learnt that sweet peppers are remarkably healthy and apparently contain a lot of vitamin C, more than almost any other fruit or vegetable. In addition to vitamin C, sweet peppers also contain vitamins E, B1 and B2. They also provide essential minerals such as calcium, sodium and iron and a pointed sweet pepper contains a lot of folic acid. All these facts, as well as more recipes can be found at the colourfultaste website. So next time you’re buying peppers, look for the ones that have travelled from Thanet Earth. They’re eco-friendly, tasty and not at all alien. 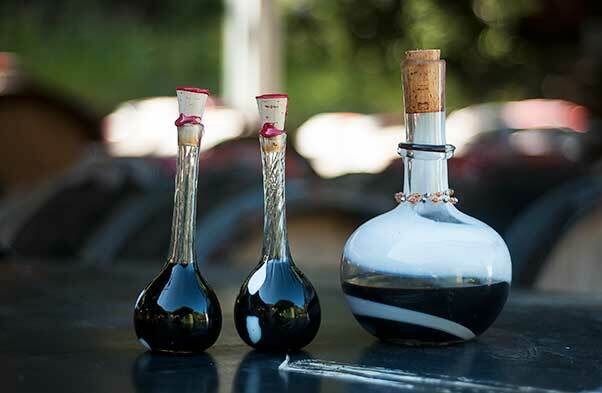 Foodies talk a lot about balsamic vinegar and its amazingness, but in the South of France there’s an artisan making something a drop more interesting and rare. ‘You need good wine to make good vinegar,’ says Nathalie gazing watchfully over her militarily ranked wooden casks. 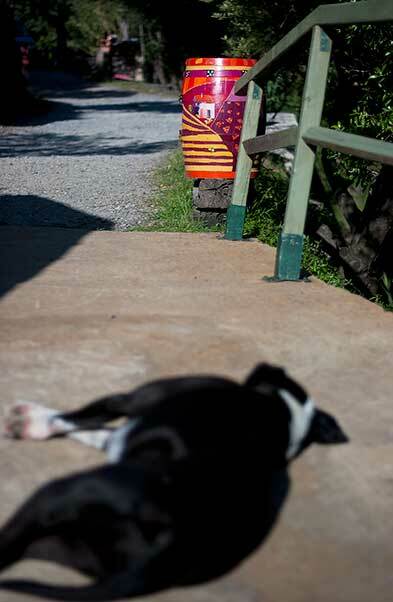 The south of France sun is beating down on the covers that shade the casks from the full heat, her dog is flopped out on the road outside. It’s too hot to do much. Time moves slowly here. 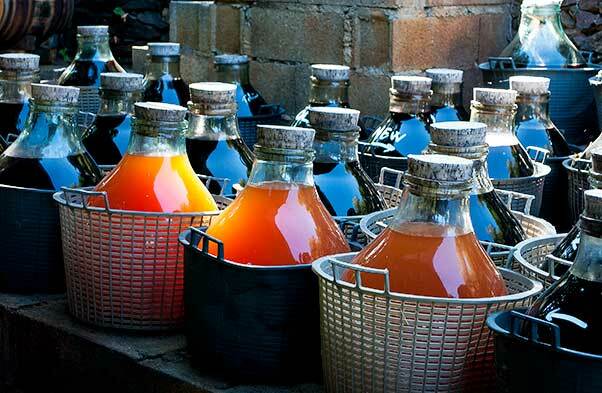 The vinegar she makes at La Guinelle, above the hamlet of Cosprons, overlooking the bay of Paulille on the Mediterranean, is made slowly and uses only Banyuls sweet wine, an AOC fortified apéritif or dessert wine made from 50% and up to 75% Grenache grapes from local vineyards. The vinaigerie is at the end of a long dusty, bouncy single lane with no housing and only a few simple, small wooden structures to be found when the track finally does peter out. There’s a kind of Bedouin open sided tent where the vinegars live, a small hut serves as an office and shop and another as a place to hand bottle the vinegar. 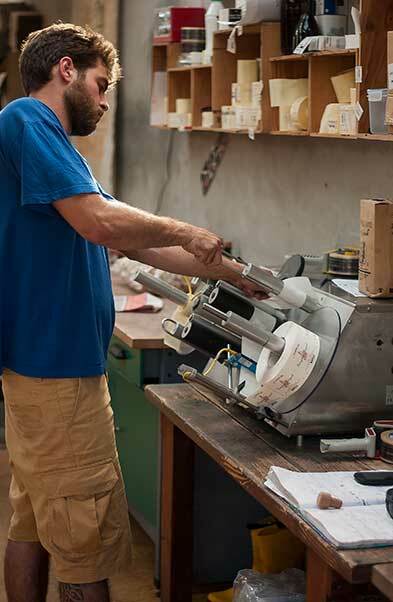 This is artisanal for sure but Nathalie is also making a highly respected product. 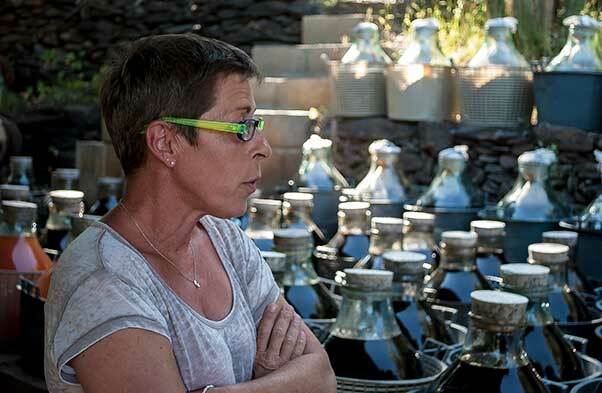 Her vinegar is sought after by many top Michelin starred chefs in France and only around 10,000 bottles are produced a year. 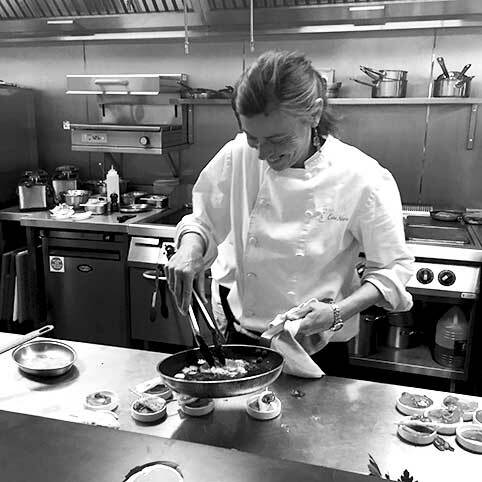 ‘I also have one chef buyer in England,’ says Nathalie, ‘have you heard of XXXX?’ She’s speaking French and while I understand her words, I simply can’t catch that name, so I nod and we carry on. She shows me a one year aged red vinegar and I have a teeny taste. ‘Splash it onto just picked sliced tomatoes or some local oysters’, she recommends. It has less than 6.5% acidity so it’s not viciously sharp and while I don’t care for fruited vinegars as a rule, these vinegars only contain wine and so I pick up raspberry aromas, along with hints of spice and vanilla, but it’s all about the original wine and nothing else. As she says, the end vinegar can only be as interesting as the wine it was created from and her vinegars are very interesting. She mentions the UK chef again, I still don’t get it. She elaborates: ‘The restaurant is called ‘edon’ It is in West London?’ Ahhh, the centime drops, Hedone is the restaurant and the chef is Michelin-starred Mikael Jonsson so no wonder we struggled with pronunciation. If he’s using this vinegar that has to be a good endorsement as his restaurant has received nothing but rave reviews. 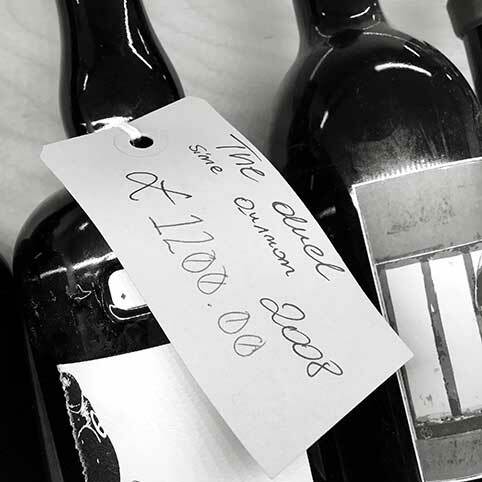 As well as various aged red vinegars, Nathalie also makes a white vinegar from 100% grey Grenache that has a lemony freshness, and she has recently branched out into more esoteric styles. She shows me a red vinegar that has undergone spherification, the El Bulli promoted method of turning liquid into tiny pearls that pop in the mouth. ‘Imagine that scattered over roast lamb!’ she enthuses, ‘or sprinkled into a salad’. She has also created a solid, almost rubbery vinegar block that can be grated finely onto dishes. Again something that can inspire creative chefs. Well what could I do? I bought a bottle; apart from anything else it was just so damned cute to look at I just had to have it. Now back in England I am splashing it on sparingly but lovingly, just the way it was made. Read about the local salt of the Sud de France and the delights of Sète and seafood. ‘Oh Dubai it’s all bling and excess isn’t it, nothing to do, see or eat there’‘ Nick Harman finds the naysayers couldn’t be more wrong. Red, red, wine, it goes to my he- eh -eh ed’, except that it doesn’t here because neither red nor white wine are an option at The Big Grill in Muslim Dubai. However I do have a compensatory stacked plateful of grilled lamb, Lebanese mashawis and other food treats to gnaw on as I tap my toes to the bland white reggae beat from the UB40 boys up on stage. It’s all part of the Dubai Food Festival, a new idea for a city more famous for soaring tower blocks, supercars on the street and money, money money than it is for food. 60.2 billion cups of tea are drunk a year, many of them by Nick Harman personally. He goes down to visit 300 year old Twinings Tea in Hampshire to discover more about their take on our national drink. ‘Shlooooooooooooorpppp!’ It’s a very loud sound and seems odd coming from Philippa Thacker who for the last ten minutes has been, dare I say, behaving in a perfectly ladylike fashion. 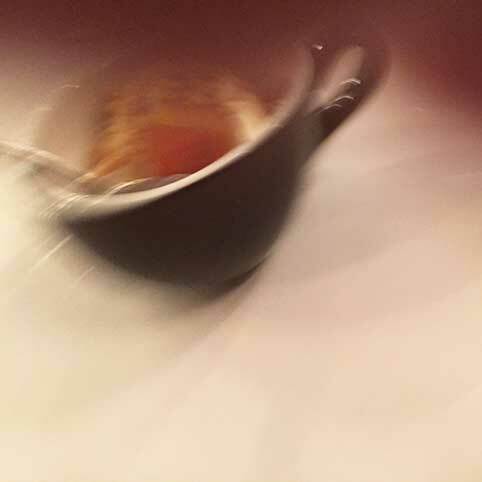 ‘Slurrrrrrp’ she goes again and then accurately directs a jet of brown tea into her spittoon on wheels. As a Master Blender it’s part of Philippa’s job to ensure that each box of Twining’s black ‘breakfast tea’ or ‘everyday tea’ you buy in the shops is of the same quality and taste as the last and is true to the secret blend, which can contain up to forty separate teas. 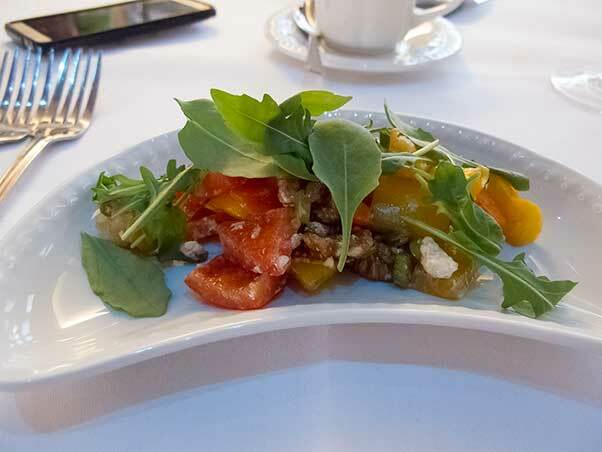 At the Phoenicia Hotel they take luxury and food very seriously. Nick Harman goes into their garden to meet the head chef and to taste the Maltese difference. I’m using it all the time since arriving in Sweden; ‘tack’ means ‘thanks’ in English. It’s the only Swedish word that TV has taught me and it’s coming in handy as I try to eat in as many places in Gothenburg as I can. There is great food to be found all over when wandering the streets of Sweden’s second city, just under two hours flight from the UK. No longer is it all about the herring and the meatballs, although those are still done very well. At lunchtime in a small square I come acrossStrömmingsluckan(Magasinsgatan), a food truck dispensing fried herrings served with parsley butter, mash and lingonberries, to people of all ages. It’s a traditional dish, the young man at the fryer, Thomas, tells me from behind his high counter, and much beloved by all. I stand eating and talking to him as he serves fast and efficiently, the sweetly sharp lingonberries cutting the oiliness of the fish perfectly, while the mash is a billowy sponge for all those juices. It’s not fine dining but it is fun dining. For a taste of something special I head off that evening to Kock & Vin(Viktoriagatan 12). Here there is no menu, you only get what’s in season with a focus on the region’s superb fish and shellfish. 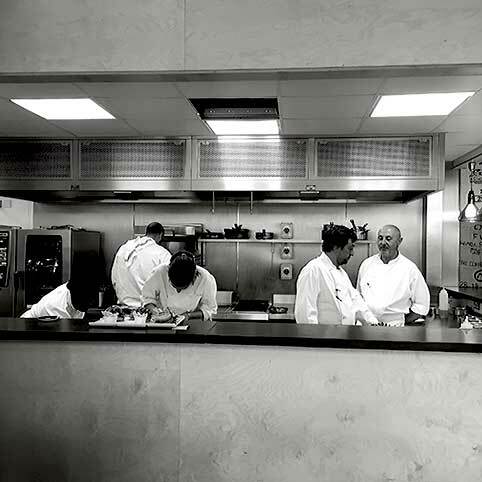 The West Sweden themed cooking here from Head Chef Johan Björkman is artistic and creative and it’s no wonder it’s one of Gothenburg’s premier Michelin starred restaurants, but of course it has prices to match. For something cheaper there is the ‘Fish Church’Feskekôrka(Rosenlundsvägen). Inside this ancient fish market is the small Restaurang Gabriel run by Johan Malm who took over the restaurant founded by his father. Johan is an imposing presence with his bushy hipster beard and big boots, but he’s a friendly giant and while we drink bitter, powerful espressos and the kitchen sets up for lunch, he explains that with all the remarkable fish stalls downstairs he can always give his customers the freshest of the day’s catch, all cooked with beguiling simplicity. ‘The cold water around Sweden really develops the flavour of local fish,’ he says and swallowing a local oyster I find he is absolutely right. Of course all this fish can get a bit much so I head over toGourmetkorv (Södra Larmgatan 6). This tiny hole in the wall sells over fifty kinds of sausages to be greedily eaten on the spot with mash, sauce and rather curiously, a slice of baguette that’s been squashed in a sandwich toaster. The average price is £7, including a can of soft drink, and it’s a bargain in this town, especially when you consider that all their sausages are made locally and contain between 85-95% meat and no additives. Needing some art therapy I found the Art Museum was well worth a visit, especially as the handyGothenburg City Card I was rocking gives entrance to this and many other museums and galleries, as well as travel on buses, trams and ferries. The restaurant next door to the museum, Mr P (Gotaplatsen 6) was the real masterpiece though. I expected the usual tatty museum café bad food and screaming children, but instead found a wonderfully modern place full of cool locals serving inventive fusion food from a terse small plate menu. Steak tartar with trout roe strewn with a crisp layer of sliced radish was a textural and taste delight and the local impossibly sweet squid with tomato, chilli, lime and avocado was stunning. In Sweden afternoons are always ‘fika’ time, a coffee break taken very seriously. Over in the pretty old Haga district with its grid of streets of ancient wooden houses and bohemian shops, there are a myriad of coffee houses serving the cinnamon roll that it’s almost obligatory to eat at fika time. At Café Kringlan, (Haga Nygata 13) the home made roll is a welcome sugar rush which, combined with the heavy caffeine hit, had me ready to take on even more walking and eating. By the time I’d reluctantly left town I had also feasted on superb saltwater and freshwater crayfish, had my fill of quality meatballs, dodged death from a really quite unbelievable number of Volvos, and yet barely scratched the food surface. So tack you Gothenburg for all the food, I’ll be back to dive deeper soon.